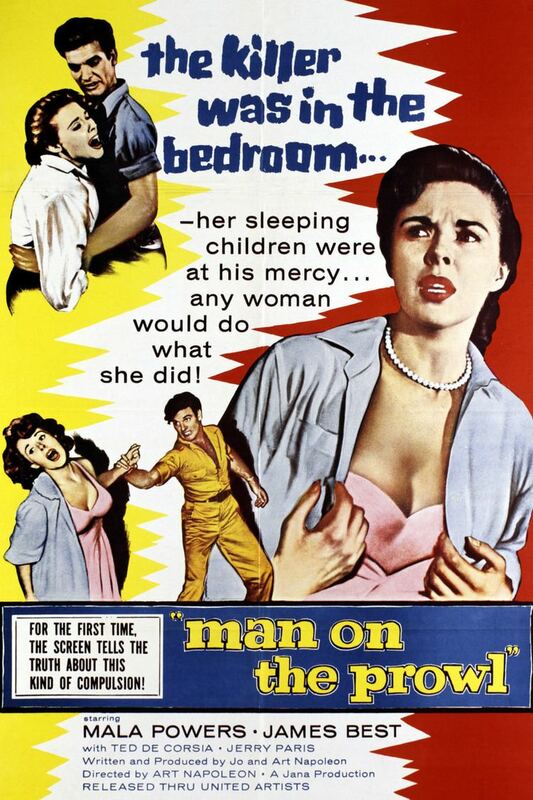 Man on the Prowl is a 1957 American crime film directed by Art Napoleon and written by Art Napoleon and Jo Napoleon. The film stars Mala Powers, James Best, Ted de Corsia, Jerry Paris and Vivi Janiss. The film was released on December 1, 1957, by United Artists. Under psychiatric care for several years, unknown to his employers, Doug Gerhardt has a job with a car dealership. He borrows a luxury convertible without permission to impress a date, but when she resists his advances at a motel, Doug kills her. On the way home, Doug nearly runs over Marian Wood and her son. Still obsessed with women, Doug steals a toy belonging to the boy as an excuse for looking up Marian later. He ingratiates himself with Marian at home by repairing her washing machine, then preys on her frustration with husband Woody's frequent absence. Doug's mother comes to see Marian, warning her about Doug's mental state and mistakenly believing Marian is romantically involved with him. Marian threatens to notify the police, after which Doug murders his mother, assaults Woody and takes their son captive. About to sexually assault Marian, he is killed when she stabs him with a nail file. On August 12, 2015, Alpha Video announced that they had located the only surviving print of Man on the Prowl, and that it'd be released on DVD in the near future.